Biology: fish is noted for the darkend spot on the posterior part of its dorsal fin. 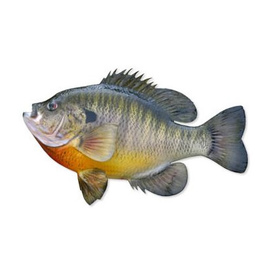 Bluegill live in the shallow waters of many lakes and ponds, along with slow-moving areas of streams and small rivers. Ranges in size from 4-12 inches (10-31 cm).